Summer = Saved | Food It Yourself! Yes, I am going to get back to nutrition and agricultural science issues that are in the news, as promised. But, right now time is tight. There are Christmas cards to send and a Mr. Food It Yourself to convince to sign said cards. 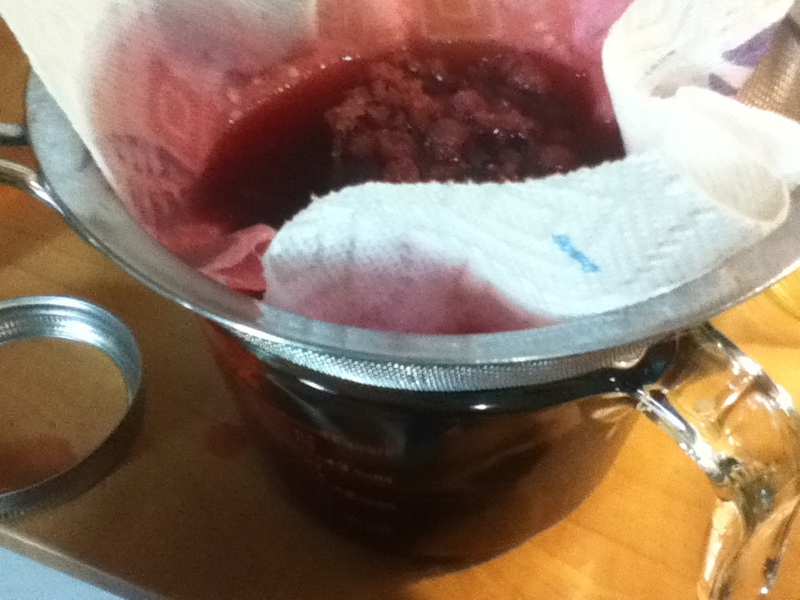 But, do you remember that fruit I macerated in sugar and covered in vodka this past summer? Yeah, I kind of forgot about them too, until this past week. 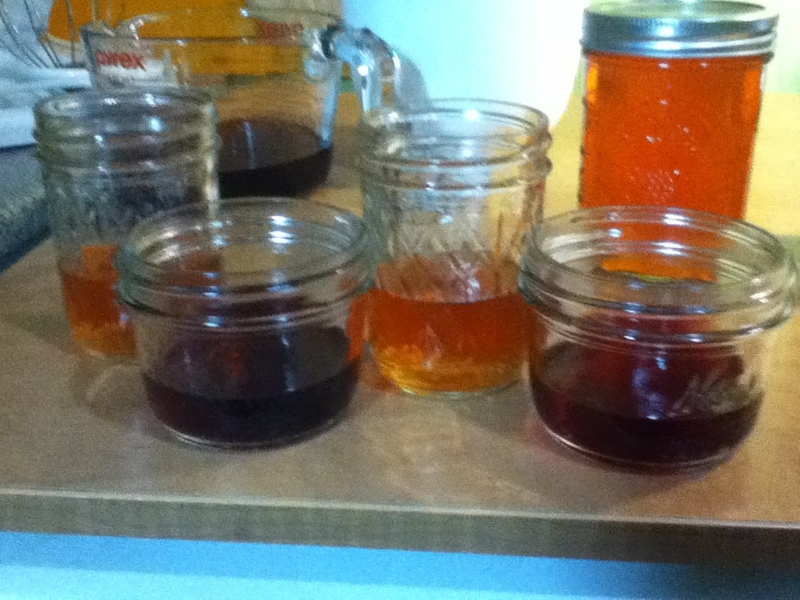 Which is fine, those cordials needed to rest and infuse. But now is the time to finish these Spirits of Christmas Present. It is a very simple process. First, strain the fruit and cinnamon out. 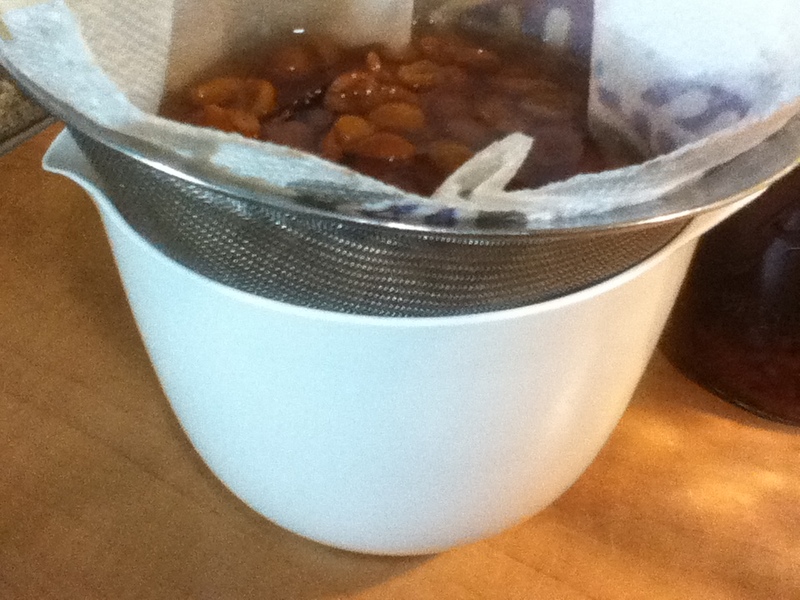 I used a paper towel in a strainer in a small bowl. The bowl has a pouring spout, for easy transference to a final repository vessel. You can also use a large liquid measuring cup to strain the fruit out. You definitely want to use the paper towel or a cheese cloth or some such thing. There can be fine sediment that can make the final cordial unattractive if not strained out. Next, Mr. Food It Yourself sampled the results. It was very strong, but we expected that. It was a little…what is the word…harsh? Yup. we drank it from jars. The flavor of the cherries and raspberries did come through, although the cherry version was a little weak. I was a bit overly optimistic at the amount of fruit we got off our trees; we have to get a bird deterrent system in place for 2016 to increase our yeild. I’m hoping the cordials will mellow a bit now that they are strained. Perhaps I will stock them away for Easter. Or Memorial Day.